This muffin recipe is perfect for breakfast because it’s just slightly sweet and packed with lots of protein and healthy fats to keep you fuelled throughout the morning. It’s the perfect combination of raspberries and vanilla. Using dates to sweeten these muffins means that they won’t spike your blood sugar as quickly as other sweeteners or sugar, plus dates are rich in a wide array of minerals and fiber. Cassava flour works well here and is a wonderful grain free alternative flour to try out if you’re gluten free or grain free. 1. Preheat oven to 350. Remove the pits from the dates and soak in a bowl of warm water. Let them soften for around 5 minutes. 2. Meanwhile, melt the coconut oil on low heat on the stove top. Turn off the heat as soon as the oil is liquified (you don’t want it to get too hot). 3. Place the softened dates in the food processor, along with vanilla extract and coconut oil. Blend until a smooth, creamy mixture is formed. 4. Add in the eggs and blend for another 20-30 seconds to combine all of the wet ingredients. 5. Meanwhile, combine the dry ingredients in a mixing bowl. 6. Fold the wet ingredients into the dry and stir to combine together. 7. Line a muffin tin with liners (this recipe made 7 muffins). 8. Scoop out the batter to fill each liner 1/2 way. 9. Place 2 to 3 raspberries in the center over top of the batter. 10. Scoop the remaining batter over top of the raspberries. 11. 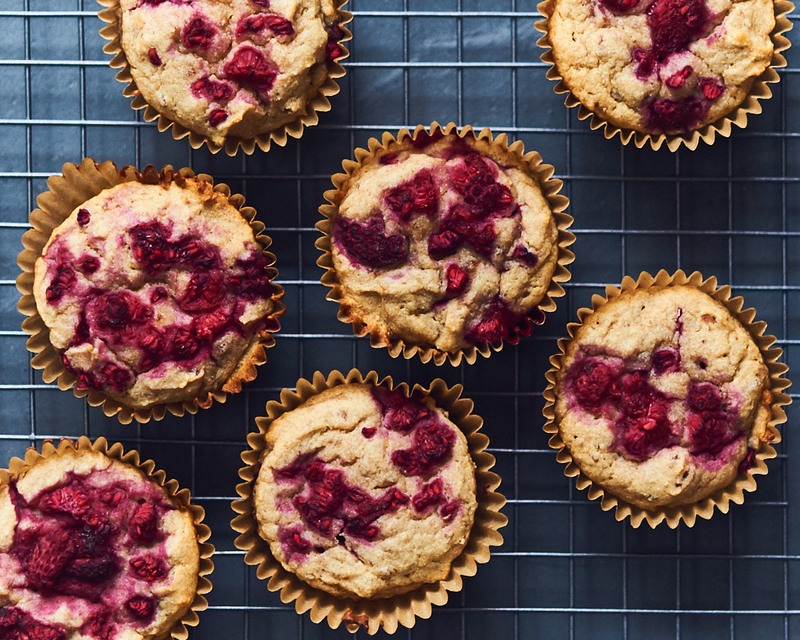 Then sprinkle some raspberries over top of each muffin top.